Social media marketing is all the rage, and for good reason — it’s a great way to create online conversations about brands, providing a two-way communication channel between companies and those who buy from them. But, most marketers got social media quite wrong at the beginning and made the incorrect assumption that social media was just like the traditional channels they were already used to, so they defaulted to treating social media like any other broadcast channel. All because they forget to open their ears and close their mouths. Social media is about creating, building, and nurturing relationships with real people who also happen to be your ideal clients. You can talk with them, and they can talk back, which is where the real superpower of social media lies. In other words, just as in real life, it pays to listen at least twice as much as you talk. The people who follow you on social media also know you’re in business, and they expect to see a certain level of information about what you do, but problems can quickly arise if that’s all you talk about! When social media first came along, overzealous marketers immediately jumped on the bandwagon to take advantage of what they saw as an unprecedented opportunity to infiltrate the conversations among the masses to get their message out to more people. The assumption was that social media is just one giant conversation about nothing, which they could use to talk about their businesses. In fact, they were so wrong that someone recently apologized on the behalf of all marketers for breaking social media! Social media has the word “social” in it for a reason. It is a conversation, but it’s not one we can just hop into and suddenly change the topic to suit our own needs. Social media wasn’t designed to broadcast sales messages in the hope that people will respond and buy stuff from you or hire you there and then. The purpose of social media is to create, build, and nurture lasting and meaningful relationships with real people, some of whom will naturally become (or already may be) your clients. And, in terms of visitor traffic, social media should direct people to your website, and not the other around. In other words, once you have people on your website, you don’t want to send them off again just to get them to follow you on social media, except as a last resort option when your primary call to action has failed to convert them. With the exception of Facebook ads, or ads on the other social platforms, try to keep the direct marketing messages to a minimum on social media. Yes, you can share links to your blog posts, which can then lead into a call to action designed to convert the visitor into a lead or a sale. But posting an update on Facebook talking specifically about booking weddings, or filling up a day of mini-sessions, probably won’t work too well. Don’t waste too much of your website real-estate on social network connection buttons, especially not in high-converting locations like the top of the page. Instead, you can post links to your social profiles on your “about” page or in the website footer section. Mix up the type of content you post on social media. Images, videos, other people’s content, questions, quotes, and interesting news stories or resources your ideal clients would find useful, are all great content ideas for social media. It’s easy to see social media as some kind of numbers game, especially when you first get into it. After all, there are so many visible metrics around social media, and they feel like they must be important for one reason or another. Numbers of followers, friends, and fans. Numbers of comments, like, and shares. Facebook page insights and other social media analytics. But the thing is, most of these don’t matter anywhere near as much as we might imagine. Insights and analytics can be extremely useful, but it’s important not to get bogged down by too many details. I know you might think people will look at how many people “like” your Facebook page, for example, and use that as some kind of yardstick to gauge your popularity or even your skills as a photographer. But this is simply not true, and believing the myth can lead you down a path where you focus too much on the numbers and not enough on the purpose or goals of social media, and can lead to you neglecting or even alienating the audience you do have. If you find yourself fixating too much on these metrics, or worrying about how many Twitter followers and Facebook fans you have, then take a step back and let those thoughts go. Instead, try to focus on the quality of your fans and followers. Are they good prospects as potential clients? If they already are clients, are you making the most of the interactions you have with them? Are you personally interacting with your social contacts by responding to comments and questions? What happens when someone shares a tweet or post? Are you thanking them? Do you work hard to engage others, or wait for them to engage you first? At the end of the day, it’s much better to have 100 true fans you can interact with regularly than 1,000 random followers who would never become your clients. Another temptation, especially from new professional photographers, is to assume you have to be active on every social network going. Right now, the most popular ones are Facebook, Twitter, LinkedIn, Google+, Pinterest, and Instagram. Then we have some of the more obscure options such as Quora, PictureSocial, Tumblr, Contrastly, fotoup, and any number of others that seem to pop up every week. As social creatures, we love to follow the herd, and can easily be fooled into thinking all these networks are essential for success. This results in spreading yourself way too thinly across the social landscape, and can render your entire social media marketing plan ineffective or a complete waste of time. Every week, I get asked the question, “which is the best social network for getting new business?” but the question is rather meaningless without any context about the photographer, their clients, and what they want to achieve. Before you launch yourself into a mad race to join every social network or new fad out there, stop for a moment and consider who it is you actually want to connect with. Your ideal clients and target market are the people you most want to build relationships with online, so take a look to see where they hang out and are most active. It’s probably fair to say that Facebook will be the most common one to start with for most photographers. But beyond that, you should look at the behavior of your clients. If they’re mostly business people, and you offer commercial headshots, then LinkedIn will be a good choice. More retail-type customers, such as weddings and portrait clients, may be using Instagram and Pinterest. To prevent yourself from being spread too thinly, choose 3 networks where you’ll be most active, and then maintain a presence with a lower level of activity on a couple of others. This way, you’ll have a much greater chance of keeping your social media world under control and more manageable. The way your brand is presented and perceived across all your marketing channels is obviously important. Your logo, the colors you use on your website and blog, and the language you use in your marketing, are all important elements of your brand. But, so are things like your approach, philosophy about photography, and the experience you give your clients. In essence, your personal brand is how others see you and talk about you when you’re not there. Social media is just one of the many places where people encounter your brand, but I often find social profiles where there is a clear disconnect with the main brand as it’s portrayed on the photographer’s website. Worse still, I also major differences in the profiles across different networks, all of which can severely break or disrupt the branding experience in the minds of your prospects and clients. To combat this problem, you simply need to ensure your social profiles are as complete and as consistent with each other as possible. Use the same profile photograph (preferably a professional one!) across all your social networks. Create a Gravatar with a photograph attached to your email address so it shows up when you leave comments on other blogs. Make sure your address, phone number, and other contact information are the same across networks. Wherever possible, fill out your profiles completely. Use the same bio, or at least a condensed version of it if space is at a premium, on different social profiles. Maintain a consistent business persona across your networks, and raise your interactions to the highest professional standard, such as you might expect to see on a business network like LinkedIn. The result of this type of thinking is defaulting to being a broadcaster rather than a true networker. The main symptom is a constant stream of updates focused solely around the photographer’s business. Links to the latest blog posts. Sneak peeks of photographs from recent sessions or assignments. Shared pages from their website. Now, these are all fine, and most definitely should be shared on social media at some point or another, but they shouldn’t make up the majority of your social media content. When that happens, we see a loss of engagement, broken connections, decreased reach, and a lack of comments or likes etc. Fixing this is quite easy. All you need do is ensure the bulk of your social media updates are customer-centric, rather than business-centric in nature. In other words, share updates designed to be of interest to your ideal clients rather than what you or your business are doing. For example, resources and articles from other content creators, news items, local interest stories, questions, quotes, videos, or featured clients. When you mix up the content in a way that feels more natural and in-tune with the intent of social media, you’ll see more engagement and genuine interaction with your followers. Then, on the occasions when you do post your own content, it will be more warmly received. This is a natural follow-up from mistake #2, but involves a more severe case of focusing on likes and followers to the point where photographers get truly obsessed by the numbers more than the quality of the connections. We’re talking about “like trains”, “like ladders”, and “follower circuses”, where the aim is to get as many photographers as possible to follow each other on social media, normally Facebook. Usually, this starts with someone posting in a group somewhere with the suggestion that everyone comment with a link to their Facebook page so everyone can “like” each other. At first glance, this might seem like a good idea. After all, it raises the number of “likes” on your page, and can make it look more serious and professional because it has a respectable number of fans. But, in reality, it does more harm than good! Since Facebook will only show your updates to a small percentage of your fans in their news feeds, and the most recent active fans are given preference, your next round of updates will most likely be shown only to your new photographer fans, and not those who could be your ideal clients (the people you really want your updates to be shown to). Unless other photographers are part of your target market, and they might be if you run workshops for example, you’ll see very low engagement on those updates, which will reduce the reach of your following updates even further. A sudden rise in “likes” also looks unnatural to Facebook, and it can mess up your analytics insights and obscure the real data you want to see about those fans who are ideal clients. This should be obviously simple to correct, right? Forget about participating in “like ladders” and focus instead on increasing your fan base naturally and organically. Your level and quality of brand engagement will improve as a result, and your updates will be shown to more people in their news feeds, improving your interactions even more. I thought this one was common knowledge these days, as it’s certainly been mentioned a lot, but I still see photographers who use their personal Facebook profile as the main place on Facebook for their business. Not only is it against Facebook’s terms of service, using your personal profile for business purposes puts too many restrictions on what you can do. You’re limited to 5,000 friends. Your family and real friends are all mixed up with your business contacts and clients. You have no access to any kind of insights or Facebook analytics from your personal profile. Personal profiles don’t allow you to run paid advertising. The obvious solution is to create a business page for your photography, and you’ll find all the information you need on how to do that on Facebook itself. A common complaint I hear from photographers about social media is that they don’t see enough likes, comments, or shares from their followers, and it makes them feel as if no one cares about what they have to say. For example, you might post an update on Twitter about your latest blog post, but no one retweets it or replies to you. Less than 20 minutes later, your tweet is practically history and all but invisible among the crowd of new tweets piling on top of it. On Facebook, you might post a link to the same blog post, but only a handful of your fans get to see it in their news feed. Fewer still like it, share it, or leave a comment. It can be quite discouraging, and it makes you feel as if you’re whispering into the wind. But social media is a two-way street. However, the traffic flow isn’t equal in both directions. For any given person, the interactions they initiate with others should almost always outnumber the interactions others start with them. This means we should be more proactive at engaging with the people who follow us, instead of waiting for them to engage with us. In other words, it’s up to you to look at your followers and fans as real people who would truly value any interaction you initiate with them. This would be like the president of the United States actively looking at their followers and then starting unprompted conversations with them. Of course, we’re nowhere near as influential as the POTUS but you can still have an impact on your followers by making the first move to engage with them. Also, you’ll want to acknowledge and respond to all comments and questions you get on your social media channels, which is where a tool like HootSuite is useful for monitoring replies and mentions of your brand etc. Of course, each of the social networks has its own system of notifications, so you can keep track of what’s happening in your social circles that way too. One of the biggest problems faced by photographers who are new to the business is building up enough website visitors to generate the leads needed to get the business off the ground. We used to be able to rely on search engine optimization (SEO) and Google for this, back when it was so much easier to get a website ranked on the first page of the search results. SEO is now much more difficult, and new photographers find it almost impossible to dislodge the established businesses from page one of Google. As a result, they don’t see anywhere near enough search traffic to build a business, so something needs to be done to supplement that. This is where Facebook advertising comes into play. But, instead of photographers embracing Facebook ads as a marketing tool, what I see is a lot of people maligning ads to the point of actively discouraging others from even trying them. In fact, the vast majority of struggling photographers I talk to tell me they have no intention of running Facebook ads in the future, either because they already tried and failed or other photographers told them ads don’t work. By the way, if you’ve tried boosting posts on Facebook and then see a decline in your organic reach, check out Facebook Deliberately Lowers Your Page Reach After You Pay To Boost A Post. Fact or Fiction? The reason most photographers fail with Facebook ads isn’t because the advertising system itself doesn’t work. It’s because the ads they ran sent people to the wrong place, or to a landing page that wasn’t already working to convert visitors into leads or sales. The truth is, you should only ever send Facebook ads to a dedicated landing page, and never to a generic page such as the website’s home page. And then there’s the issue of conversion performance. Facebook ads will only amplify the effects you’re already seeing with your destination page. If you just send more people to a landing page that already converts poorly, it will continue to do so, just with more people, and it will consume your ad spend for little or no tangible results. Of course, you can (and should) use Facebook ads to send a certain amount of test traffic to a landing page if you don’t naturally have the amount of visitors needed to establish a baseline in a short timeframe, but the investment in those ads should be considered part of your testing or R&D budget, rather than strictly as marketing. A Facebook page from which to send ads. The Facebook tracking pixel installed on your website so you can target previous visitors. A well-defined audience to whom you’re going to aim your ads. Dedicated landing pages for your ads with a specific conversion goal (not necessarily a sale or booking). Compelling images and headlines for your ads. A small budget, say $10 – $20 per day to start off with. A way of keeping track of your performance. You can find information on most of these topics in the Facebook help sections, or by searching for the latest articles on Google. I’m sure you’ve already discovered that managing social media, even for a small business, can be time-consuming and almost enough for a full-time job. With so many other things to take care of in the business, keeping up with your social media marketing on a consistent basis can be a real challenge, and it can easily become neglected or something you do only when you think about it and feel like you have the time, which is probably less often than you would like. Unlike blogging, social media streams are fast-moving and have incredibly short half-lives, which means they can run dry very quickly. The result is reduced engagement from your followers, even when you do post new updates. With every post dated with a timestamp, social media channels are not too good at hiding the fact that they haven’t been updated for a while. This can also lead to lost followers because there’s little reason to follow anyone on social media who doesn’t post on a consistent and regular basis when there are so many other updates competing for your attention. So how can you keep your social media channels alive and kicking when you have so many other important things you to focus on at the same time? Part of the answer is to help yourself get more organized, with a social media posting schedule or calendar you can use to keep you on the right track. The other part is to make use of automation tools like Buffer, HootSuite, or Edgar. These tools are designed to make your social media posting more efficient by setting up schedules and queuing up content and updates far in advance. My personal favorite, and the one I use is Buffer. They do have a free option, but I use their “Awesome Plan”, which is absurdly cheap for such a high-quality service. The ability to have separate posting schedules for each social network. Detailed analytics for your updates. A simple Chrome extension to help you buffer content straight from your browser. Able to connect with a wide variety of social networks. By using automation tools for your social media updates, you’ll increase engagement, get your updates seen by more people, and save yourself a lot of valuable time. You invest a lot of time to create awesome content—make it count by getting it shared on social media. 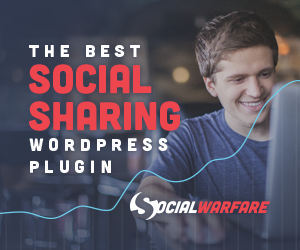 I’ve tried almost every social sharing plugin on the market, and struggled for a long time to find one I can recommend, until I found Social Warfare. This simple-to-use social sharing plugin not only makes social sharing EASY, it even lets you create tweetable content inside your posts and pages to increase engagement even further. Less emphasis on the number of like, followers, shares etc.